With sweeping views of the Tay, this year the top floor of the Crawford Building is aptly suited to some of the young artists and their work; there is a strong theme of being connected to the landscape through geological observation or site-specific myths. As I begin my travels, I find myself in the Scottish Highlands with Zoe Webster and her charcoal drawings and paintings. She provides us with a tranquil environment despite the dreich weather overhead in some parts. In the clearings of the charcoal, the viewer is rewarded to inspect closely, finding hidden faces and creatures. These uncanny figures mean no harm, originating from the folklore belief that dead spirits return to the landscape, never leaving us. Webster’s work is successfully eerie while also comforting. The weather eases yet the temperature has dropped significantly in Heather McNab’s space. Remaining in the Highlands, McNab’s paintings of snowy mountains and sculptures are cool in tone, creating an imaginative and isolated landscape for the viewer to step into. The fluid, marbling effect of the paint opposes the concrete sculptures standing like islands in the sea. This juxtaposition alludes to her interest in the changing geology of the landscape through natural erosion. In this exhibit, the outside environment (the view, the sound of birds nearby) is part of McNab’s medium as it flows in to become a part of the installation. Step out of the cold of McNab’s work and into the office space of Camissa Bruce. This young artist has explored her interest in cartography, creating a series of maps that cross reality and fiction. Opposing map-making conventions, Bruce’s maps cover an unusually small geographical section. Judging by the books in the installation, I would guess this is somewhere in the Fife area. 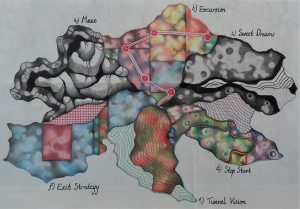 Instead of using maps to navigate the landscape, the viewer is given a map of the artist’s personal life, seen through lenses such as “Maze”, “Sweet Dreams” and “Tunnel Vision”. Arriving at the East Coast of Scotland, Katie Parkin confronts us with the sheer scale of nature. 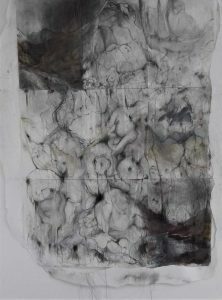 An entire wall displays a fortress of a cliff formation, bringing the landscape into the canvasses using ground rock from the location as well as charcoal and lithography techniques. Parkin also explores erosion as rising sea levels alter rock faces, making us aware of the fact that even unpopulated landscapes are affected by our ecological footprint. Included in her space are smaller studies which animate the rock surface as something that oscillates between metal and molten lava. Melina Doumy’s dreamlike watercolours, illustrative charcoal drawings and a stormy oil painting weave together stories and myths from other cultures. Part of the exhibit takes us far afield on a personal journey to her home country of Greece, to a once heavily religious town on top of a mountain. In Arch, I’m looking out at an indiscernible and tempestuous horizon, where distorted faces try to call out something. A note reads: “Maybe this is a reminder that people are”. Are what? ‒ the sentence unfinished and I’m left with an ominous feeling. The other figures in her work offer no further clues to this mysterious message as their facial expressions range from heavy contemplation to serene detachment. These five young artists have taken us on a journey through landscapes real and imagined, giving us a retreat from the urban environment. They offer us a variety of ways to be connected, through the personal maps of our lives, stories, and direct placement in nature.